This is a nice example of a more scarce 1848 dated Ames cavalry sword. This is one of 3,800 sabers produced on contract with Ames in 1848 and issued to Federal Dragoons in the Mexican War then later issued to cavalrymen in the Civil War. Its heavier weight earned it the nickname "Old Wristbreaker". It is marked on one side “N.P. AMES / CABOTVILLE / 1848” and marked on the reverse "US / WD". The original buff leather washer remains intact and in good shape. Blade has minor normal age pitting with no dings and has never been sharpened. the brass hilt is tight and the pommel cap is marked "WD / J.W.R." The grip is in wonderful shape and retains 98% of the original leather intact. The wire on the grip is a new replacement of the original wire. Jeff Leathers did the work on this and was able to replace the wire without removing the hilt so it all remains untouched. The steel scabbard has minor pitting from ages but no dings or dents. The ring mounts are tight and secure. 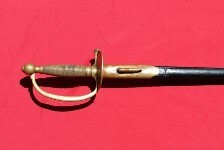 This is a very nice example of a scarcer model Ames cavalry saber. 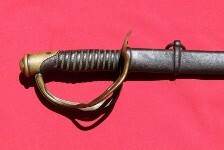 This Roman gladiator style artillery short sword was popular from the 1830's through the Civil War. This 1832 sword is a first year production model. This is an example of a Union made sword but these swords were produced by both armies during the war. The stamping on the blade is very worn but reads "UNITED STATES/1832" on one side and "N P AMES/SPRINGFIELD" on the reverse. The eagle above the Ames stamping is almost entirely worn away. Beautiful blade on this harder to find 1832 dated sword. This is one piece that was certainly there and saw action. Check out the top ring mount and the amount of wear - this one spent many hours in the saddle. The grip is in good shape with wire intact. On the grip, some leather is worn through to the wood from extensive use. There are 2-3 small nicks in the blade possibly from war time usage as patina matches the rest of the blade. The scabbard has several "crimps" along it to keep it from rattling while riding on horseback. Super cool piece that shows natural war time wear. This 1861 Ames NCO sword is in great shape with leather scabbard intact. There is one crease in the leather scabbard below the throat but no weak spots. Markings on the blade are sharp and clear with a blade you can see your reflection in. 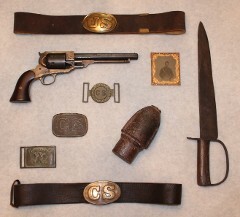 A good solid example of an NCO sword for your collection. 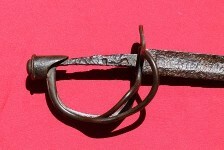 This is one super cool relic - a complete excavated Model 1840 Cavalry sword. It was dug on private property with permission at Brandy Station, VA. The Battle of Brandy Station was the largest cavalry engagement of the war pitting Federal forces under the command of General Alfred Pleasanton against Confederate forces under the command of General J.E.B. Stuart at the start of the Gettysburg campaign. This sword is in great relic condition with the only flaw being a bent tine on the guard possibly from a horse falling on top of it during the engagement. This could be the centerpiece of any dug relic collection. You won't see another one of these for a long, long time.